The LECOM license plate allows alumni and friends of the college to display their LECOM pride wherever they drive. 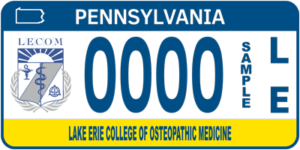 In addition, every license plate purchase supports the LECOM Student Scholarship Fund for a one-time fee of $125. Price includes PA license registration and production fees and $93 of the purchase is considered a tax-deductible donation to the scholarship fund. Additionally, you may personalize your plate with up to five letters, numbers, hyphens and spaces. 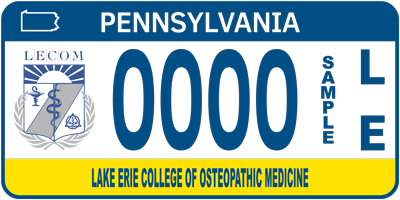 Personalized plates cost $230, which includes additional fees and a $94 tax-deductible scholarship fund contribution. These license plates are only available in Pennsylvania. Please see application for instructions. For questions about the license plate program, please e-mail us at communications@lecom.edu. Do I have to be a LECOM Alum to purchase a plate? No, all alumni, students, employees and friends of LECOM are welcome to purchase the plate and show their LECOM pride. The typical processing time takes approximately 8-10 weeks. Can I purchase a personalized LECOM License plate? 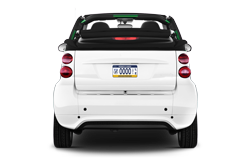 Yes, you can personalize your LECOM license plate for an additional $105 plate fee (total price with Pennsylvania fees is $230). Please see Section D of the application for more information. To check and see if your desired numeric and alphabetic configuration is available visit PennDOTs Driver and Vehicle Services website, Online Services, Plate Availability. May I purchase a license plate as a gift? Yes, you can purchase the license plate for someone else, but you will need to make sure the application contains the information for the vehicle owner and the vehicle that will use the plate. May I purchase a plate to hang in my home or office as a decoration? No, all plates must be registered to a vehicle for your application to be accepted.